SHOP owners in Inverness Street have levelled a litany of complaints at council bosses, blaming nosediving trade on the “third world” market in front of their premises. Despite a £1.5million revamp in 2006, businesses in the historic market street say that their turnover is worse than ever due to a “medieval circus” of badly positioned stalls and tourist tack. They claim that drug-dealing has also crept back into the market, encouraged by the barrows and stacks of refuse left out by traders at the end of the day. Christie Singam, the managing agent for all bar two of the shops on the street, said: “This has been a seriously wasted opportunity. It could have been amazing as a market for residents – instead it looks like a market in a third world country. Mick Marshall, manager of On the Floor Records, said that shops were getting lost behind the closely placed stalls and the large canopies, but insisted it was not the traders at fault. “We were misled by the council in consultation. In an ideal world this would be a farmers’ market on the other side of the street. But the way it’s laid out now, people don’t know there’s anything along this street apart from the market,” he said. Market traders, who preferred to remain anonymous, saw things differently. “The market has been here for a hundred years, so it’s the businesses that are new, not the market. “The businesses behind [us] feed off the trade in the market – that’s why people come down the street,” said a stallholder. Several traders agreed that the canopies were a hazard but scoffed at the accusations of rubbish. “You should see all the cigarette butts from their bars I have to sweep up every morning,” said one. Mr Singam said they would continue to campaign for the stalls to be relocated to the far side of street and the tourist stalls removed. They would pay increased rates for pavement dining and display space to subsidise the market’s revenue, he added. But traders said the idea was unrealistic. “The whole thing is geared up for tourists. It’s the not the type of place where you can sell goats’ cheese and knitted sweaters,” one said. 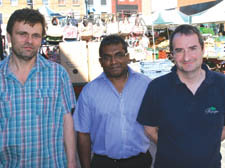 A council spokeswoman said: “Our market inspectors visit each day to deal with any issues around trading and cleanliness and deal with any complaints.